In this class we take a closer look at the 2D pipeline. Individually we come up with a story to produce from start to finish. We will animate a key character moment in our story. The students can write for a television series, feature film or a short. I have had this idea for a short and decided that this class would be a great way to get it started. The story is another personal experience when I used to play piano two hours a day for seven years but I stopped playing once my grandmother passed away. The character to play myself in this story is a grim reaper based creature who plays a requiem for the grandmother. At the end of the song the grandmother passes away and the piano player is left alone for no one to play for. I imagine that this grim reaper is one of many necessary creatures that play requiems for the people who are about to pass. Their job is to help the living pass by playing a nice song. This is the first time playing the requiem for the piano player. For my animation I will have my character express loneliness and the realization of what her job really means. 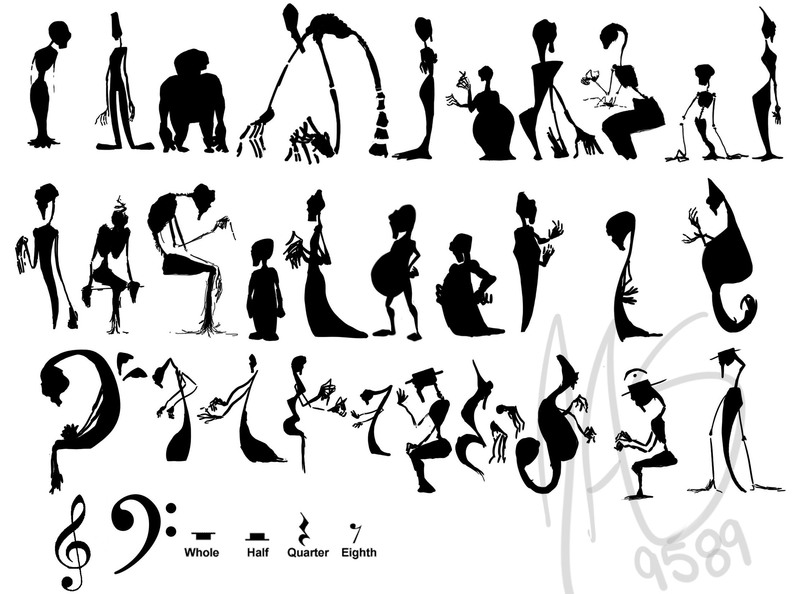 I began character design with basic shapes and then went for humanoid shapes. Towards the end I used the rest note as a shape.